My studio is in our former living room/dining room. 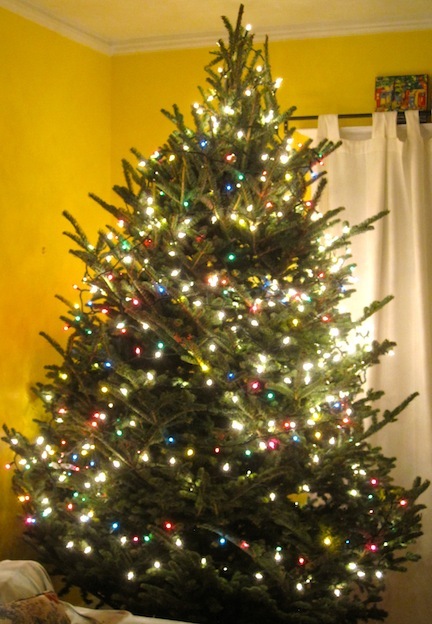 year's tree, is our living room. that corner of the studio. a beautiful tree like this one, even more spectacular. last night, and I am still working on commissions. So..
and Friday I will be shopping. but I'll keep in touch. and her feet are going numb. Happy Holidays to everyone. It is a lovely time of year. hearts. Canadians are a mighty friendly bunch too. Claus is Canadian. So there you go -- eh. 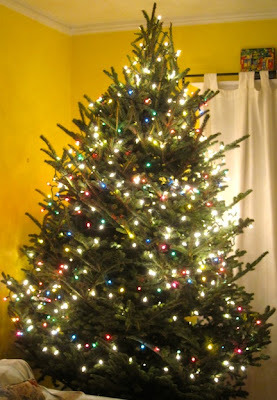 Labels: The 2010 tree -- a glorious one. Hi Barbara! Merry Christmas to you, it is a magnificent tree!! How wonderful to have it glowing away in your studio. Tomorrow is my turn to get the tree up too! Barbara, your tree is beautiful! You inspired me to get out the decorations and to put up lights. That is some wonderful fragrance you'll have in the studio! Good luck with the shopping. Take your ipod and play soothing music! Oh, I am so happy for you and your dear family! You have a most excellent tree and I'm sure you will have a truly memorable and warm celebration. Those warm Canadian hearts just can't be cooled. Thank you so much for sharing the eclipse photos. They were incredible! I couldn't stay up. Baaah! I love Zoey's coat. Wish I could give her a big hug. She is adorable. Wishing you and yours all the best. Next year will be much, much better!